← Iguana Wish You a Happy Birthday! I made this card this past spring for my nephew who is Jewish. In order to downplay the bunny as an Easter symbol I used over sized flowers and wished him a happy spring instead of a happy Easter. 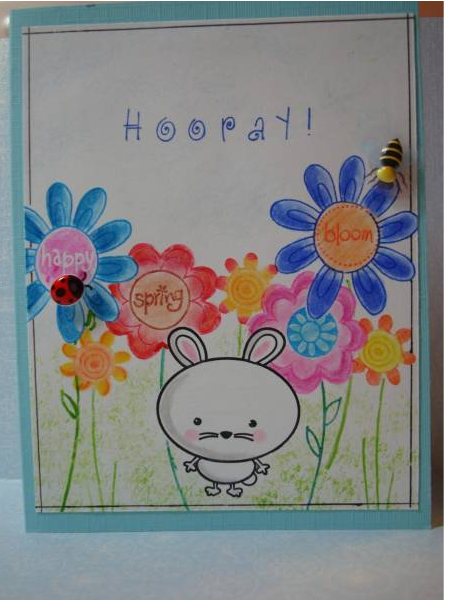 The bunny stamp is a $1 wood mount stamp from my local Michael’s store and the ladybug and bee dimensionals were clearance rack grabs from Michael’s too. Posted in Easter Cards. Bookmark the permalink.